Last summer I visited the Cal Academy of Sciences in San Francisco and admired the chameleon on display. I mentioned to my daughter that I wanted to get another chameleon some day, since we had a few as pets more than ten years ago. Not long after, my daughter and her family surprised me on my birthday with a ten month old Ambanja panther chameleon. His many colors inspired me to name him Picasso. Both images on this page are of him. His friendly and and sweet demeanor make him the perfect companion. He likes to climb onto my arm when I open his cage and eats insects out of my hand. The scientific name for Panther Chameleons is Furcifer pardalis. Panther chameleons are from the coastal islands of northern and eastern Madagascar where they live in tropical forests. Thus, they like humid and warm environments. Panther Chameleons are bred in the United States, and these captive born chameleons make better pets. They can be purchased through pet stores and on the internet. 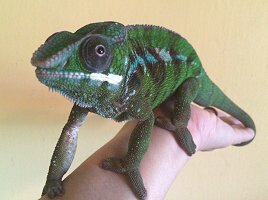 If you are interested in keeping chameleons as pets, it is nice to go to local reptile shows. Breeders can advise you on the needs of your new or potential pet, since they require a specific diet and environment. I like to attend the annual Sacramento Reptile Show which usually takes place the last weekend of September. Picasso is from The Serpentarium in Elk Grove, another great place to visit. They often have reptiles for adoption at low prices and are the cheapest local place to buy crickets. Other things to consider when purchasing a panther chameleon are the fact that males are much more colorful than females and grow larger. Males can grow up to 20 inches while females are usually 12-14 inches. With females, you need to ensure she has a place to lay eggs, otherwise she can become egg-bound and die. Unfortunately adult panther chameleons cannot be housed together. Two males will fight, and males and females should only be together for a short period when breeding to prevent harm to the female.